6202 was the most succesfull of all the attempts to improve on the low thermal efficency of the steam locomotive. In its 15 years it ran nearly half a million miles in revenue earning service, only the war made maintenance and improvements impossible. 6202 and 6210 a sister engine but with normal cylinders and motion ran a series of trails between Euston and Glasgow, both engines however put up nearly identical performances, 6202 showing only a 4% saving on coal and 10% on water,,not enough to warrent further locomotives of that type. 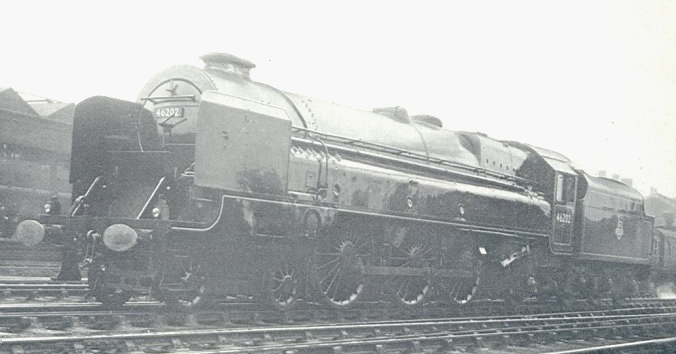 6202 entered Crewe works on 6th May 1950 and reappeared over two years later as a conventional reciprocating 4-6-2, entering service on 15 August 1952 as 46202 'Princess Anne' and covering only 11,442miles, it was involved in the Harrow Accident and was written off.